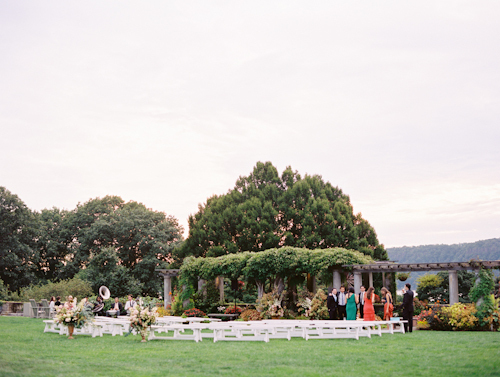 The details in Emily and Marco's September wedding at Wave Hill were a sight to behold that day. 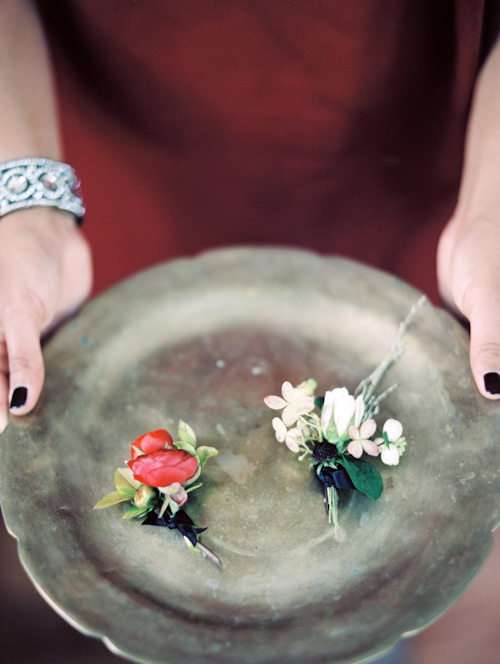 The one and only Saipua created a floral dream that brought Wave Hill to a whole other level. I loved the four lush urn arrangements and the white benches for their ceremony at the romantic pergola overlooking the Hudson. At Wave Hill House, they brought the garden inside with lush garlands, gorgeous flowers, towering trees on the tables and glowing candlelight everywhere. In this digital world, I have to say it makes me adore paper and beautiful invitations even more. 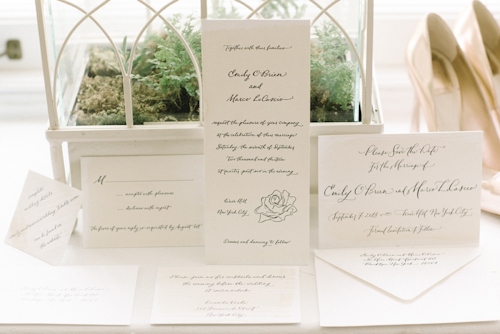 Katie Fischer Design's invitations were my absolute favourite from last year. The perfect combination of modern, fresh and elegant. Paperfinger calligraphed all the text, Katie hand drew the rose, everything was letterpressed on thick stock and Katie hand painted each piece the colour of cafe au lait dahlia (which needed a mix of four different colours). I am sure their guests appreciated that each piece of stationery they encountered was a piece of art! Now let's talk about the fashion! Untraditional and down right amazing. Emily wore a white J. Mendel top, a pink and gold rose Dior skirt with black tulle underneath, and metallic rose gold Dior shoes. 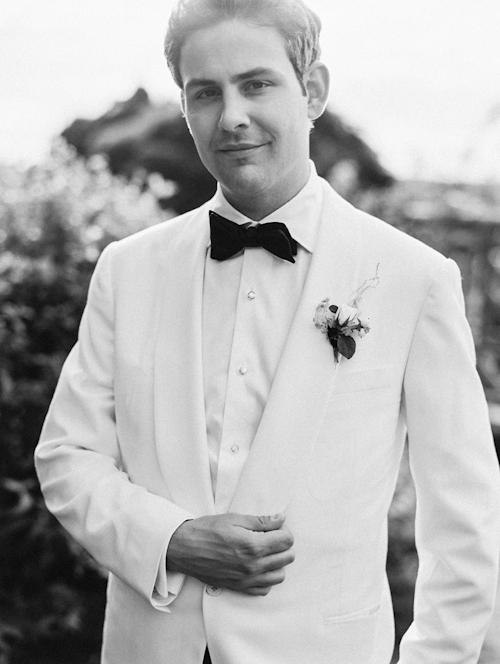 Marco wore a crisp white dinner jacket from Ralph Lauren. Don't you think more men should wear this at their weddings? Another unique element I loved was their jazz band The New Orleans Swamp Donkeys that played their ceremony, led a second line to their cocktail reception and kept the party going during dinner. Later that night DJ Sam Turner from Beat Train Productions played a great set and kept everyone on the dance floor. A big thank you to the talented Jillian Mitchell who captured this special wedding in such a light filled, romantic and striking way. It was so hard for me to edit the images down for this post! 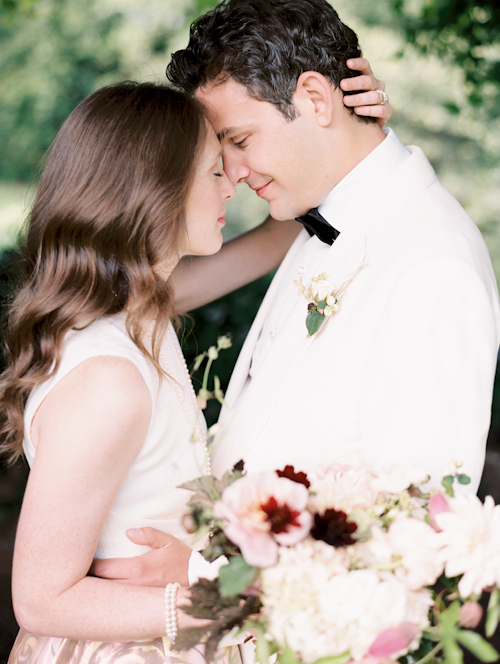 Emily and Marco's wedding was published in Martha Stewart Magazine, on their website, and in Once Wed.